This precious Afghani is descended from one of the finest hash-making cultivars ever brought from the Hindu Kush to the west. 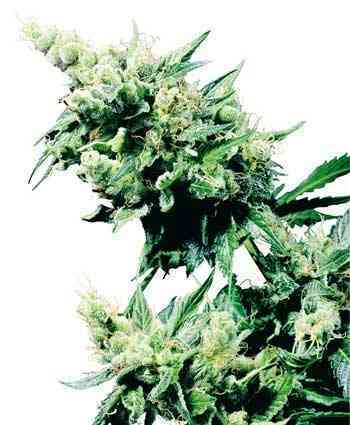 Cannabis strains known generally as hash plants are found throughout the countries that border these mountains, but very few have the pedigree of this Hash Plant - a living definition of the stocky, chunky, beautifully sticky Afghanica genotype. The direct ancestor of Hash Plant was developed in the Northwest USA and came to Holland as a few carefully-transported female cuttings. Upon arrival, the tiny, fragile Hash Plant clones were given a safe home in the Sensi Seed Bank breeding labs, where this outstanding cultivar quickly proved her worth, becoming an important building-block in several other Sensi hybrids. Over the years, many experimental crosses were made in search of a pollen-father that could match up to the HP female and produce seeds worthy of the Hash Plant name. An equal partnership was eventually found in a male from Afghanica’s other royal family - the Northern Lights line. A 50/50 HP x NL#1 father was back-crossed to the original HP mother, which gave us the 75% HP-25% NL hybrid. Of all our breeding experiments, this crossing produced the strongest specimens by far — with even experienced Dutch smokers having trouble finishing a single joint. Thus the Hash Plant seed strain was born. Hash Plant stays compact during her extra-short flowering time. Her tight, resin-drenched flower clusters develop a brittle surface when dried and give off a deep, rich Afghani aroma that’s undercut with a hint of hashish. When smoked, her dominant flavour is the spicy-sharp bite of smouldering resin glands, a sensation which quickly becomes indistinguishable from her effect. The instant vaporization of those layers of sparkling trichomes accelerates Hash Plant’s rapid, blissful and breathtakingly powerful body-stone.